Pictured: Netflix (left), Disney (right), Netflix’s Marvel properties (center). Good news, Danny Rand fans! After years of trailing along sadly behind other, better, more interesting shows, Marvel’s Iron Fist has finally found a way to distinguish itself from its fellow Netflix Marvel entries: By being the first one to get kicked out of a window and straight into Cancellation Land. For watchers of the online streamingverse, though, the most ominous set of words in that otherwise boilerplate statement are pretty easy to pick out: “On Netflix.” At this point, Disney is well into its brewing Cold War with its ostensible partners at Netflix, as it continues to solidify previously licensed properties for its own long-in-the-works streaming service. It would be borderline insane to assume that today’s cancellation notice was motivated primarily by some desire to have all that great “Danny Rand mopes about stuff” action for itself, as some kind of selling point for the unnamed service. 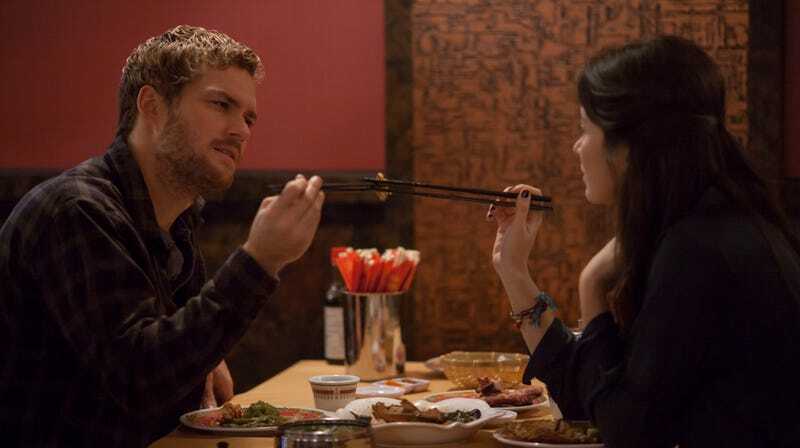 But the company was also careful to note that “the immortal Iron Fist will live on,” suggesting that it’s at least somewhat interested in repurposing the character—who’s had some peaks of non-TV-based popularity in recent years, thanks mostly to the work of creators like Ed Brubaker, David Aja, Matt Fraction, and Travel Foreman—for some kind of more effective or interesting use.